Every week, we go Live at Five on Facebook and Persicope to show you all the latest and greatest VR experiences that we can get our hands on. 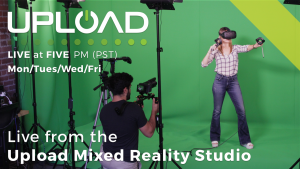 Every show is shot using a green screen and an HTC Vive in the mixed reality mode to give you the best angles to watch. This week, we had Tilt Brush artist Steve Teeps in the studio to show us behind the scenes of what it takes to create dark and mysterious Tilt Brush art and character designs, and on Friday, we had all our friends and family from the Upload Collective companies hang out on on beanbags and play Google Earth. As a bonus clip, I’m throwing in our writers’ Joe Durbin and David Jagneaux’s thoughts and impressions on the PSVR launch titles! 3D artist extraordinaire Steve Teeps made an appearance at the Upload Mixed Reality Studio to show off his work in the Doctor Strange promo video. He also brought a ton of his work in Tilt Brush over the past year, showing us the amount of features that have been added since Google’s acquisition of software. Finishing off this long week, the members from Upload Collective companies raided the Mixed Reality studio to talk about their childhood memories and give us tours of their home town. Too bad the my country is flat! Throwback Sunday? For those of who you missed it, the Playstation VR had a big launch, and who better to tell you what to play than Senior Staff Writer Joe Durbin and Games Editor David Jagneaux! Want to us to feature your game on our live shows? Send us a build of your game to test it in Mixed Reality! Pre-requirements (at least for now): HTC Vive / Unity. You decide what games we should play next! Let us know in the comments below!